I don't understand. I see embedded youtoob vids on other sites just fine. Worked for me with Adblock enabled (not using Flashblock or Click&Clean). Had to tell Noscript to "allow this page". If you thought cartoon mating dragons was objectionable....You might have censored it. I still don't understand why this board is the ONLY site online where I cannot EVEN SEE embedded YouTube vids. Strange. Well it has to do with something in linux because those of us running Windows see the embedded videos with no problem. At the top of Sunrat's post (# 4) I see some html that looks like he's trying to make a couple of IFrames, followed by an a href paragraph, followed by the words "Nope, that doesn't work." Below that, is a video, that's being blocked by my "noscript" browser add-on. If I tell noscript to "allow this page" it will play. By clicking "quote" to see what he typed. The working video appears to be nested in "media" forum code. I can't speak for the administrators of this forum, but back when "dunning forums" were popular, we avoided a lot of mischief by blocking html in posts. Edited by Pete!, 04 September 2017 - 01:35 PM. The ONLY browser I have on this system that can "see" embedded vids here at Scot's is Seamonkey. Neither FF nor Pale Moon show anything but a 3" x 5" or so blank image holder that when right-clicked just shows my adobe flash settings. I've tested this with ALL addons and plugins disabled in FF. Still just shows the above. So, what's different about Scot's and say my board at ProBoards, for example? Hmm... very different. The second one (at my board) is very simplistic and does not use param values. Well, that may be a hint as to what's going on here. I copied the last line of sunrat's post.... I can watch the video. Edited by Pete!, 04 September 2017 - 07:03 PM. I can watch it too, if I copy the raw vid url, but embedded vid does not work for me. 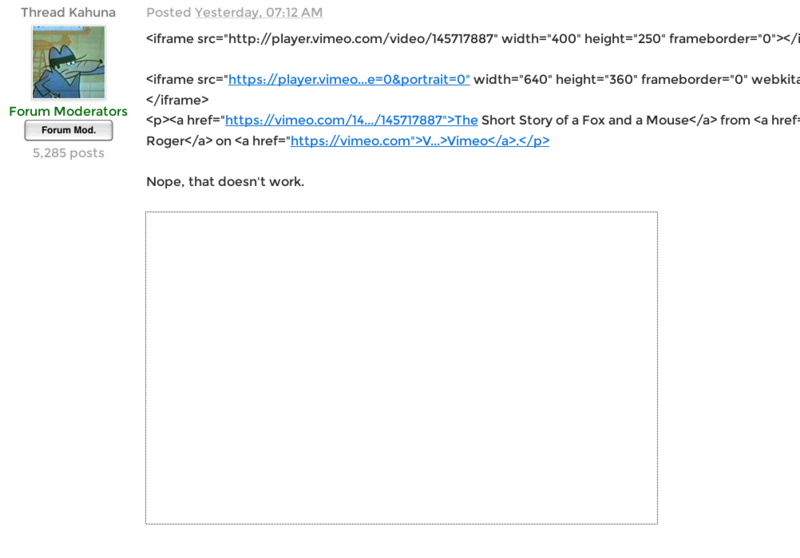 The first part of my above message was testing to see if Vimeo could be embedded. That's what didn't work. When I tested the YouTube video (with the http tweak) it worked fine. In Firefox in Linux. Lately I've been getting the latest Flash directly from Adobe, extracting it and putting libflashplayer.so in ~/.mozilla/plugins. Works every time whereas the old automatic packages like flashplugin-nonfree are currently broken. I'm running Palemoon v 27.4.2 on a Win 32 computer and can see and play YT and Vimeo. Meh... embedded vids issues at Scot's are NOT high on my priority list right now. You guys obviously solved whatever YouTube video embedment problem. Good job! I watched both videos. Edited by Cluttermagnet, 12 September 2017 - 07:26 AM. Special Limited Edition Cluttermaster 2007 with direct air cooling system. "It takes only one bulldozer to raze an entire village..."
"Hey, Fred- isn't that your kid driving that bulldozer?" Hasn't been solved for me, but I'm special. Hey! 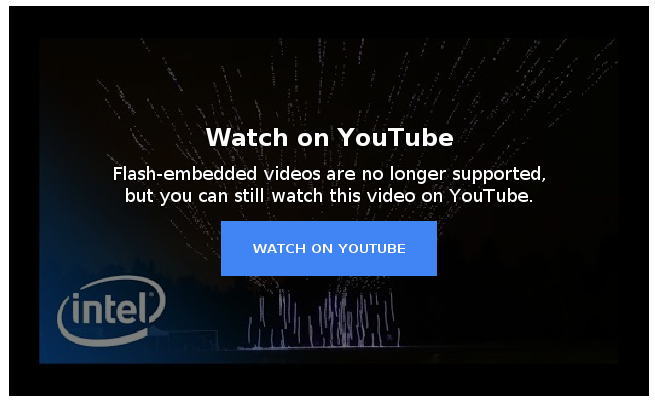 I just noticed something.... Now I can see the embedded box, but it has an image and a notice that YouTube no longer supports flash-embedded videos. Well, that's an improvement over the blank white space in these posts. Clutter... Vimeo's nothing new. It's been around since 2004. This has Codecs 243/opus (251) according to debug info. I don't know a thing about codec 243 or optus 251. These are open, free alternatives to the proprietary HEVC H.265, AAC, and mp4. When I say "new", WebM has been around for 8 years and VP9 for 5. It plays fine when I actually go to YouTube, though. The 243/251 version is what my browser shows for this video. Why such an old version? I have FF ESR 52.6 on Win XP and 7. Version 52 ESR came out in June 2017 and will be supported through August 2018. Native WebM support by Mozilla Firefox, Opera, and Google Chrome was announced at the 2010 Google I/O conference.